Place the pulp, oats, dates & raisins, chia seeds, and pumpkin spice in a bowl. 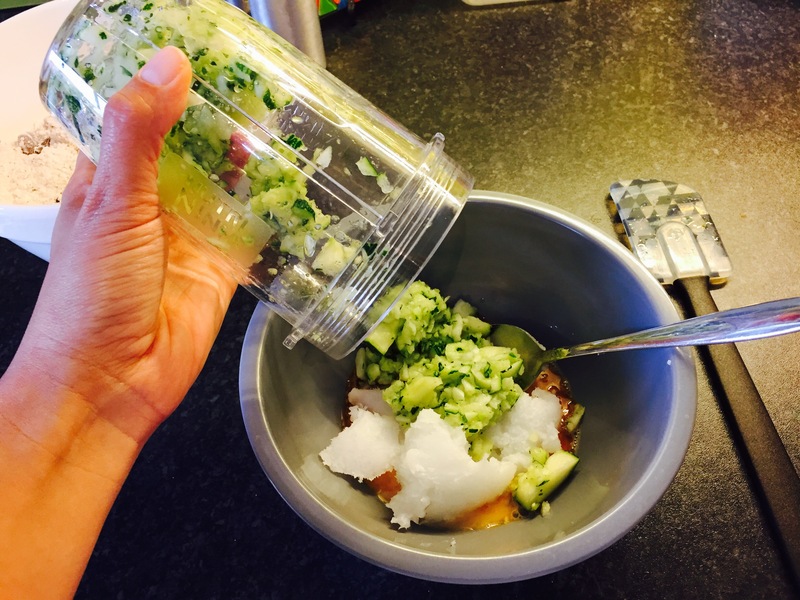 The pulp is moist, so I found it best to mix together with a fork, working all the ingredients together as much as possible. Once mixed, it should look a bit crumbly, as seen above. Next, add the honey, nut butter, and pumpkin. Really stir it through so that all dry ingredients are well incorporated. If the mixture is too dry and not holding, you can add a bit more pumpkin. If it’s turned out too wet, just sprinkle on a bit more oats. After rolling into a ball, I squished pumpkin seeds onto the outside. You really have to press them in as they don’t stick easily. Alternatively, you can drizzle the balls in chocolate or icing, then put the seeds on. And there you have it, Pumpkin Spice Balls! They were super easy to make and would be a fun activity for little ones. There are also a lot of ways to adapt this recipe to your liking. You can always use maple syrup or golden syrup instead of honey. And if you like them sweeter, add more honey and slightly less pumpkin to bind. I think toasted pecans or chocolate chips would work really well in these treats. 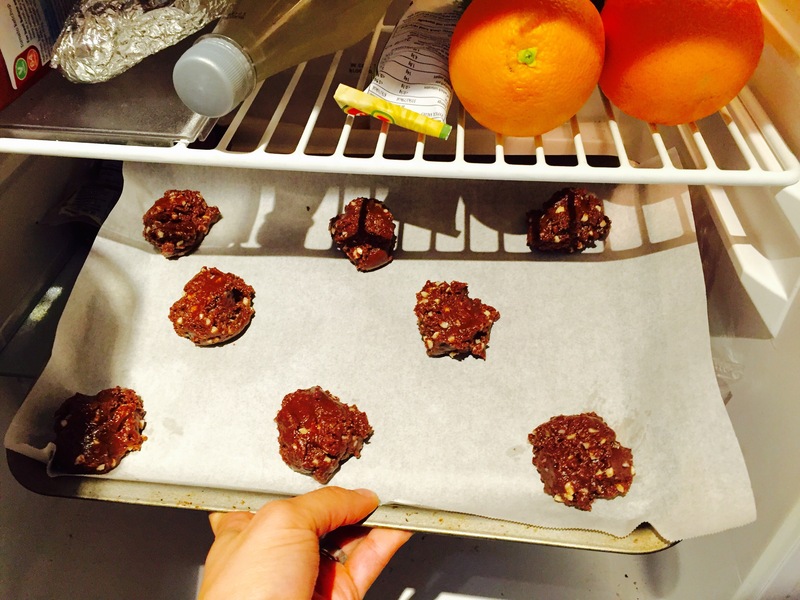 However you make them, this is a great way to create a healthy snack without producing much waste. Enjoy the sunshine while it lasts! Thanks for reading and Happy Eating! This cooler weather has been so nice and comfortable. It’s the perfect temperature for running and cycling, and for foraging wild fruit on the way. First wash the fruit very well, then peel and chop the apples into chunks. Put all the fruit into your baking dish. Pour the sugar and flour over the fruit, and mix it around trying to coat the chunks as much as possible. 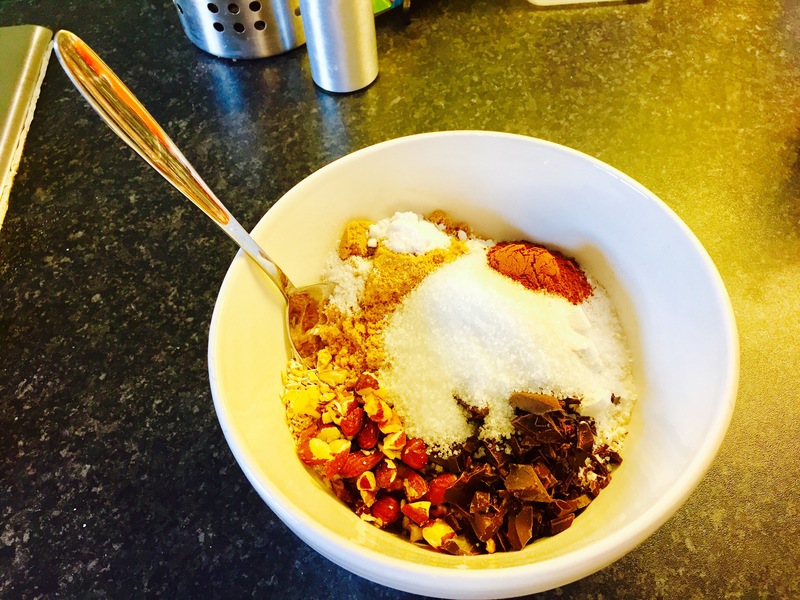 Next you will prepare the topping, which is essentially a bowl of porridge. Put the oats, cinnamon, almonds, raisins, and almond milk together. Let it sit for about 5 minutes so the oats absorb as much of the liquid as possible. Spread the topping over the fruit. Make sure it’s as even as possible. Place in the oven at 180 C / 350 F for 35 – 40 minutes, depending on your oven. It’s done when the fruit is soft and the topping is golden brown. And there, you have it, Wild Fruit Crumble! You can pretty much use any fruit you want. Damson, blueberries, and red plums work well too! And the topping is on the healthy side compared to traditional crumble which often has a lot of butter and sugar. 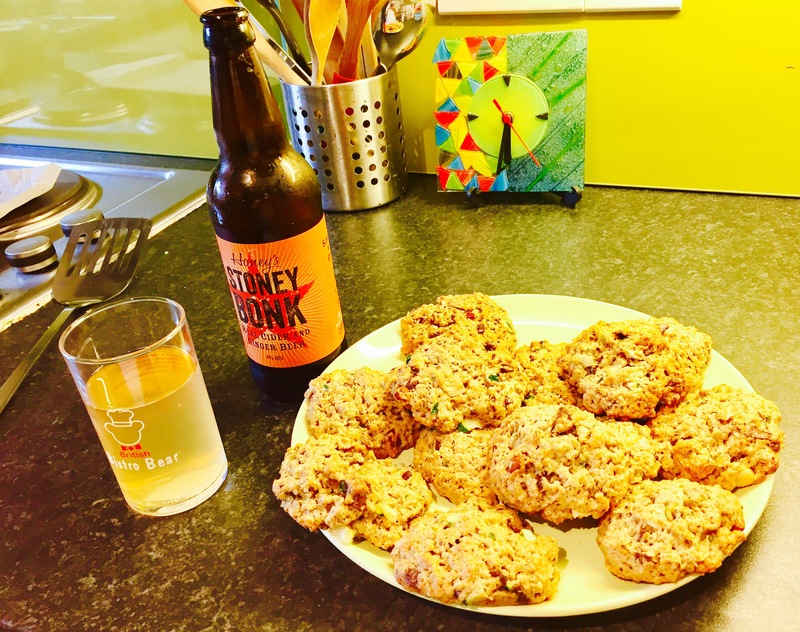 As I’m training for the Bristol Half Marathon, this is definitely a dessert I can get behind! And you can even have it for breakfast! It is part of your five a day and a lovely way to fuel your morning workout. Give this recipe a try and you can start by picking some wild fruit. Thanks for reading and Happy Eating! Step one, pour all ingredients into a bowl! Great recipe right? I did make my own almond flour with raw almonds I got from the Zero Green shop in Bristol, and added some organic cranberries I got there as well. And if you’re looking for a coarse coconut flour, I got this one at Southville Deli ages ago, but I’ve also seen the same brand at Sainsbury’s. Next, mix it up! If you find the dough is still a bit dry, you can add a bit more syrup or almond milk to bind it together. Once the dough is a bit sticky, roll into cookie like shapes and place on a plate. Pop into the freezer for about 30-45 minutes to set. And there you go, No Bake Cookies, made unique by whatever you’ve got in your kitchen. There are a lot of ways to personalise these as you see fit. You can add nuts and/or chocolate chips. And you can substitute honey or maple syrup for the golden syrup. Or drizzle caramel or chocolate on top. Oh go ahead, just dip them in the chocolate! And the best part is that you don’t have to power up the oven! Make these ahead of time for a cool summer treat, or to bring to a World Cup get together. Stay cool Bristol, thanks for reading and Happy Eating! First, I made some fresh almond flour. Simply put some almonds into a blender (I have a Ninja) and pulse it up! Pulse until it turns into almond flour, as seen above. Now for the crackers… you’ll begin by beating the egg really well. This will be one of the main binding ingredients. Then add all the other ingredients to the beaten egg. Mix very well. Once it’s nearly combined, use your hands to press it together. Once you’ve got the dough together, roll it out to a few millimeters thick. These are hearty crackers, so I find they end up being thicker and denser than your typical boxed cracker. Once it’s rolled out, you can cut into squares or use cookie cutters to make them look fancy. Place them evenly on a nonstick tray or line with baking paper, and bake for 10 minutes at 350 F / 180 C.
And there you have it, Almond Flour Crackers! These are flavorful, savory, and the perfect addition to any garden party. They are lovely with dip or cheese, but just as enjoyable on their own. I originally found this recipe on the California Almonds website, which called for all almond flour which is a great gluten free option. However, I found it to be a bit grainy, hence the addition of plain flour. However you decide to make them, give these a try, you won’t be disappointed! First, beat your eggs very well. Next, add the coconut oil, peanut butter, vanilla, sugar, and salt. Mix this very well. Last, add the baking powder and coconut flour. Combine thoroughly. It may take a few minutes, but keep stirring until the batter is smooth. 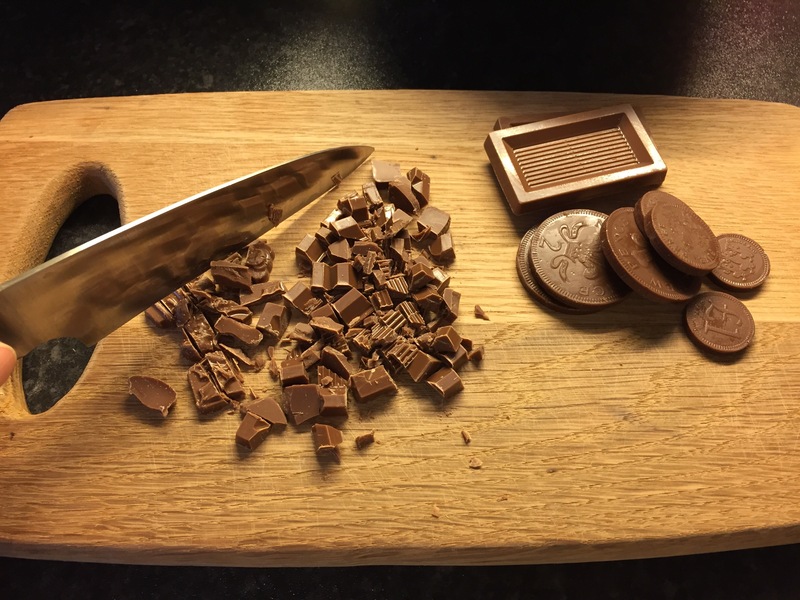 You will then chop up some chocolate and throw that in. You can also substitute nuts instead of chocolate if you like. 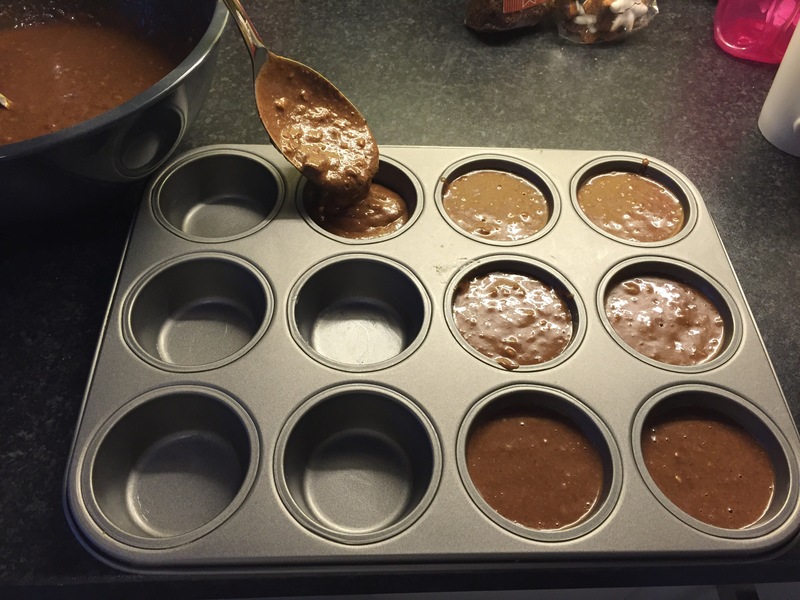 Line or grease a muffin tin for 6 muffins. I seemed to have lost my 6th one, so greased it with coconut oil. Bake at 400 F / 200 C for 10-12 minutes. And there you have it, Peanut Butter Chocolate Muffins! These are packed with protein and are a great post workout snack. Or a post work snack, post nap snack, etc. 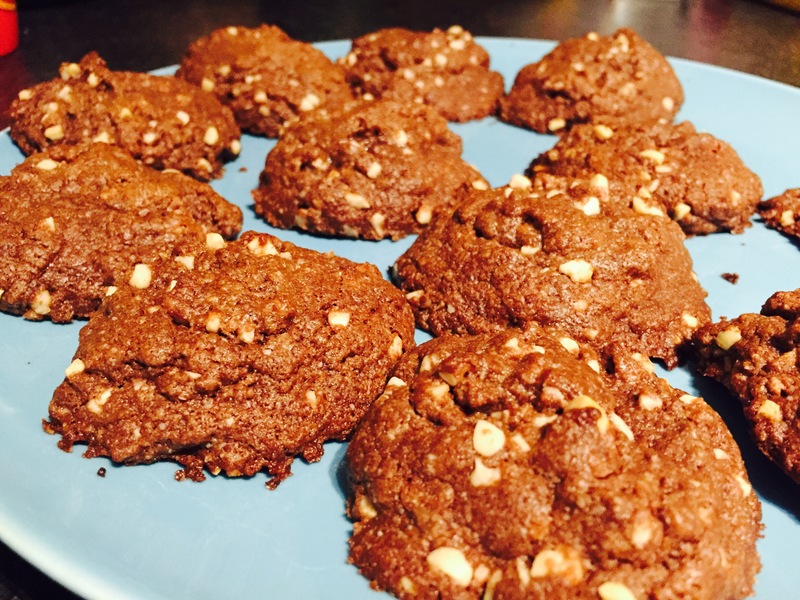 And since they don’t contain refined flour, it can be a great gluten free treat. They come together quite quickly, making these muffins an easy treat to whip up today. 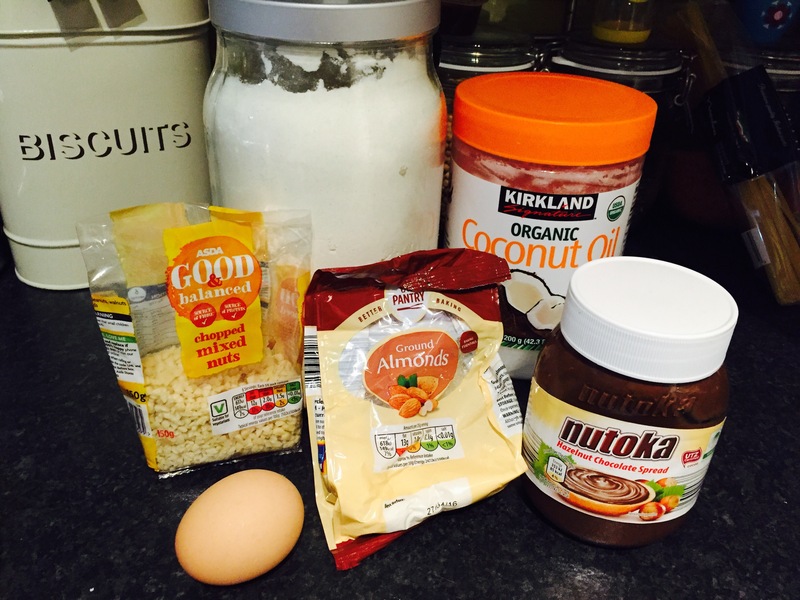 Use up the last of your Easter chocolate by giving these a try! Thanks for reading and Happy Eating! First, beat all 4 eggs very well. Next, add the almond flour and essence. You’ll then add the cinnamon and ginger. 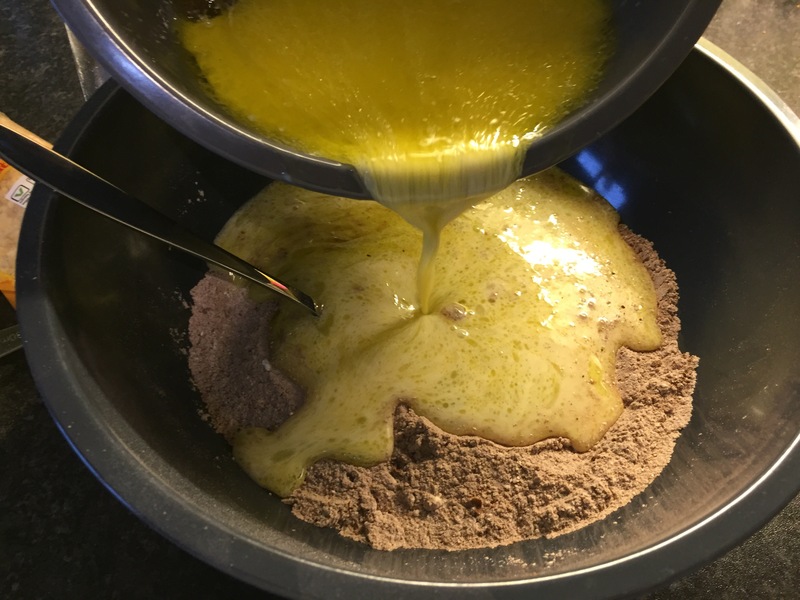 Using a ladle, pour a scoop of batter onto a hot greased pan. Move the pan around to ensure an even coating making a round crepe. Cook for about 2-3 minutes on each side. Once cooked, spread almond butter onto the crepe. Then sprinkle sliced almonds on top of that. Fold over and voila! And there you go, almond crepes. I have to be honest here, they turned out ok. The texture was great and they were quick and easy to cook. But for me, they tasted a bit too eggy. These may be a better recipe for a savoury crepe. But I ended up adding a lot of maple syrup for more sweetness. I think I’ll have to perfect these a bit more by adding some rice flour, sugar, and more cinnamon. But still, very filling and a great option for gluten free or carb free friends. Try it out and let me know what you think. Thanks for read and Happy Eating! First, mix together all the dry ingredients. 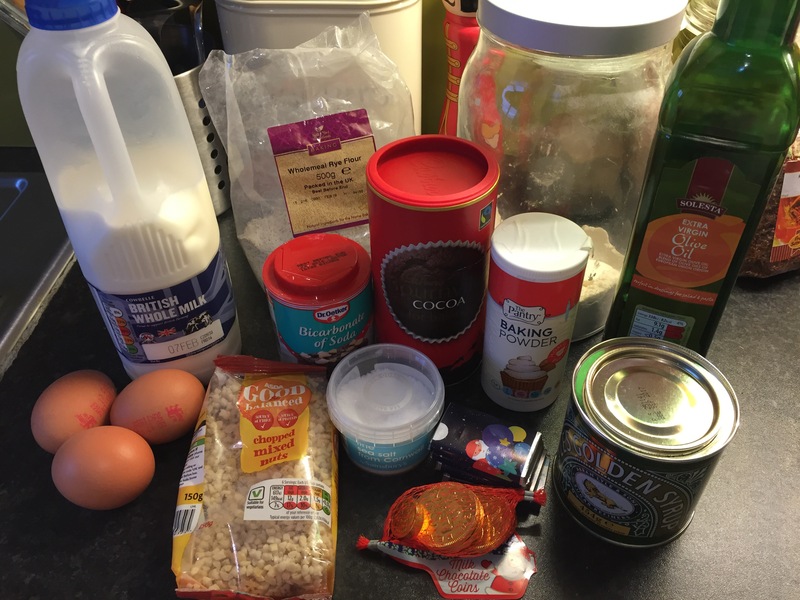 That would be the flour, oats, both sugars, cinnamon, baking soda, salt, nuts and chocolate. Next, in a separate bowl, beat the egg. 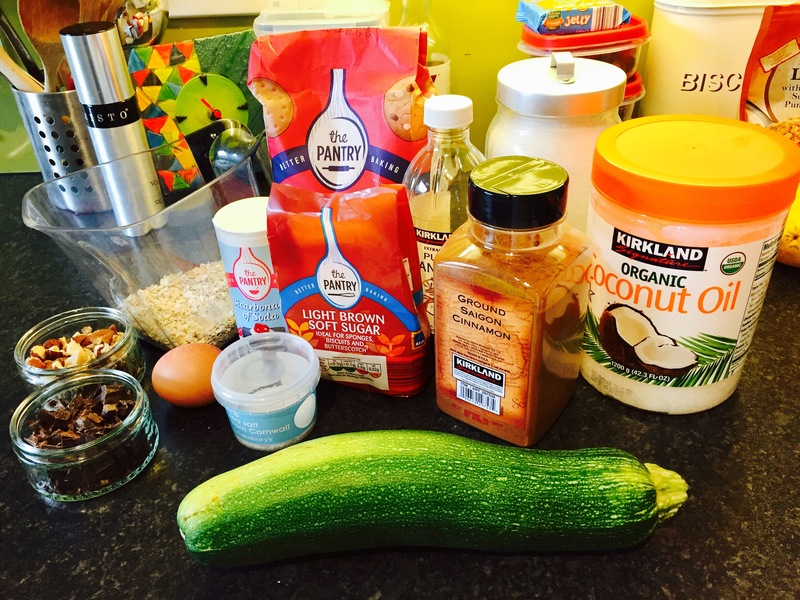 Then add the coconut oil, vanilla, and zucchini. 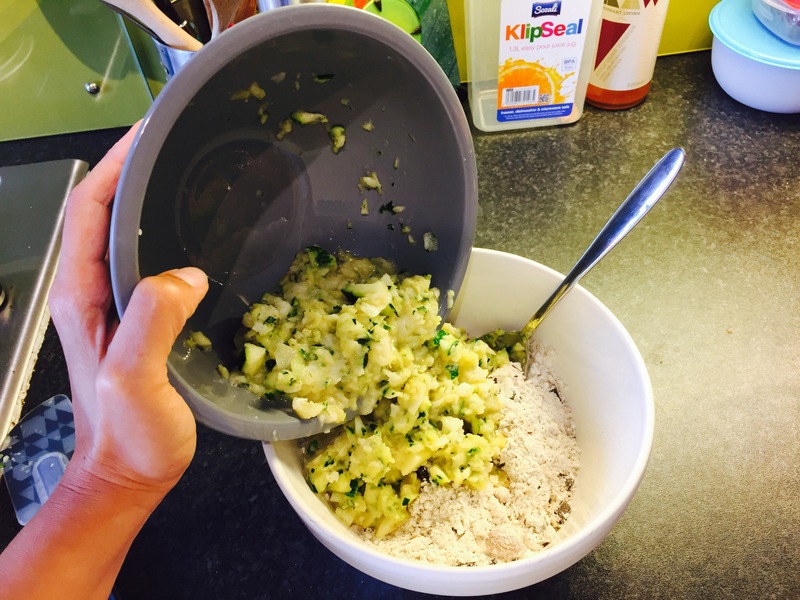 Mix it very well so that all wet ingredients are distributed evenly. 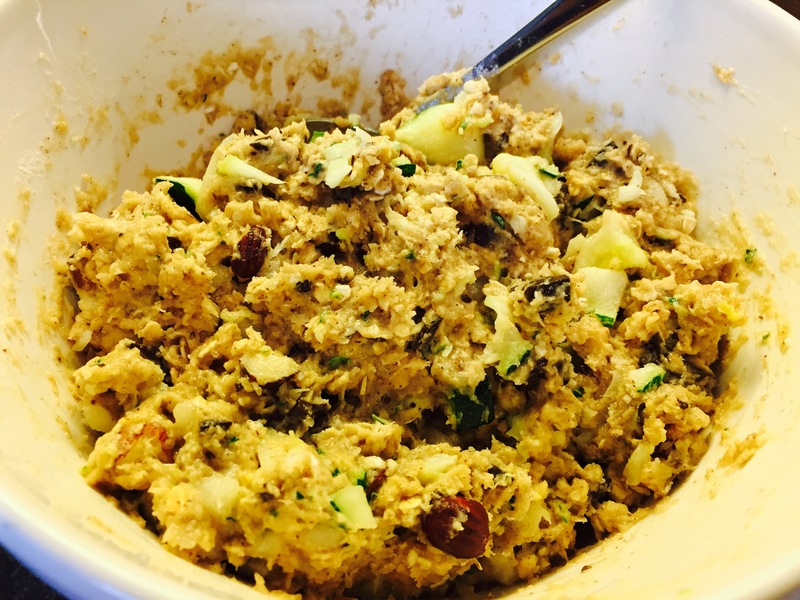 You will then add the wet ingredient mixture to the dry ingredient bowl. As you stir the ingredients, it will be thick and sticky. Carry on until all the dry bits are absorbed and thoroughly combined. At this point, you may even want to finish mixing with your bare hands. As long as you wash them first of course. 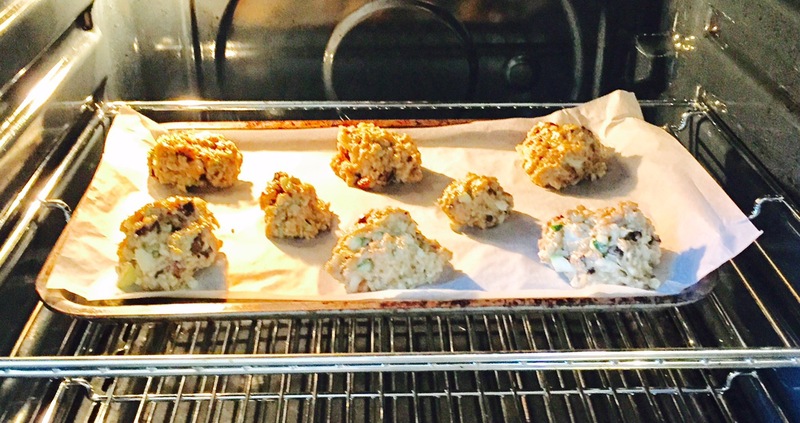 Preheat your oven to 180 C / 350 F. Spoon out balls of dough onto a sheet lined with baking paper or greased foil. Make sure to give them some space in case they spread out while in the oven. Set the timer for 13 minutes, baking until firm and slightly golden. That’s all for this week folks! I hope you enjoy trying these out in your kitchen. You can add more sugar if you like things sweet, or substitute raisins for the chocolate. Whatever way you make it, these make a delicious afternoon snack for the rainy summer days we’ve had this week. Thanks for reading and Happy Eating! 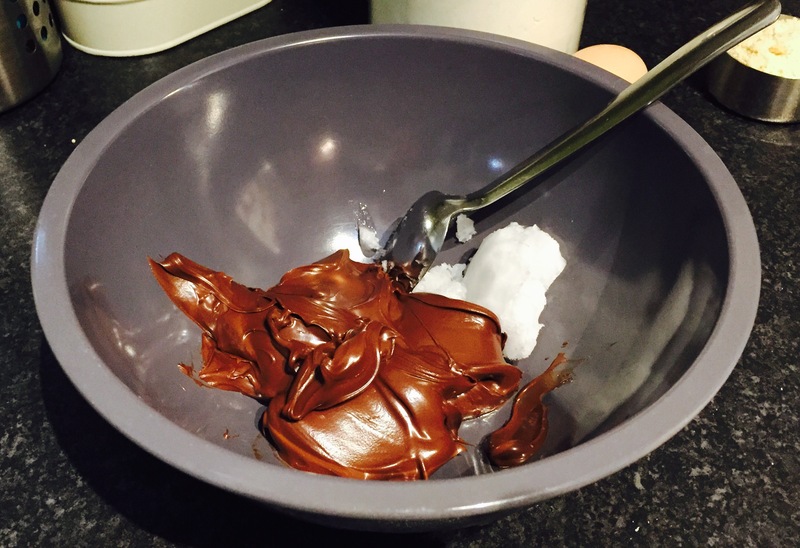 First, soften the cocconut oil and hazelnut butter, mixing well. 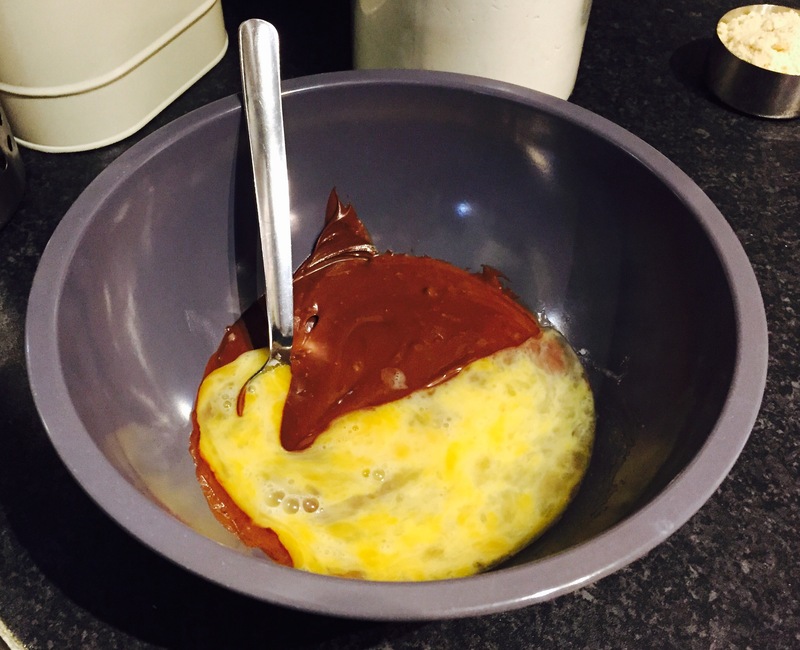 Beat the egg, and fold it into the mixture. Add both flours and nuts to the mixture. 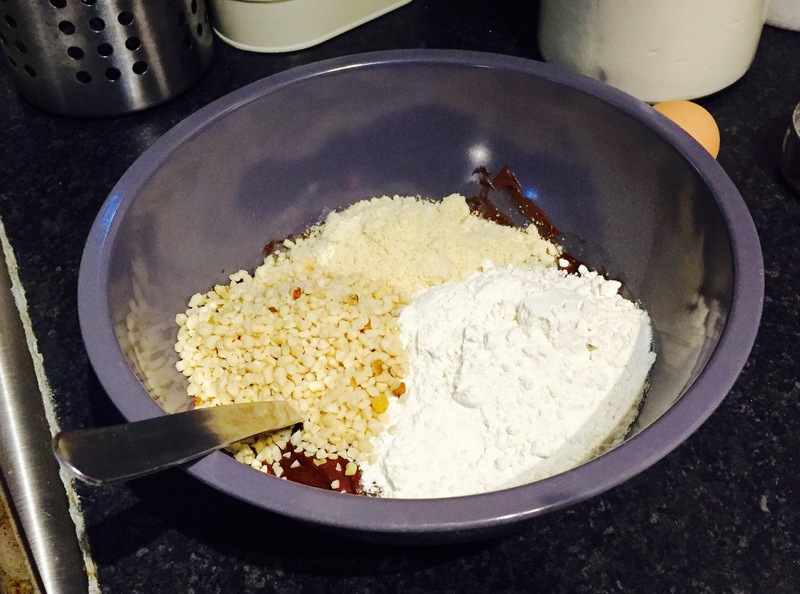 Make sure the flour is incorporated all the way into the chocolate mixture. 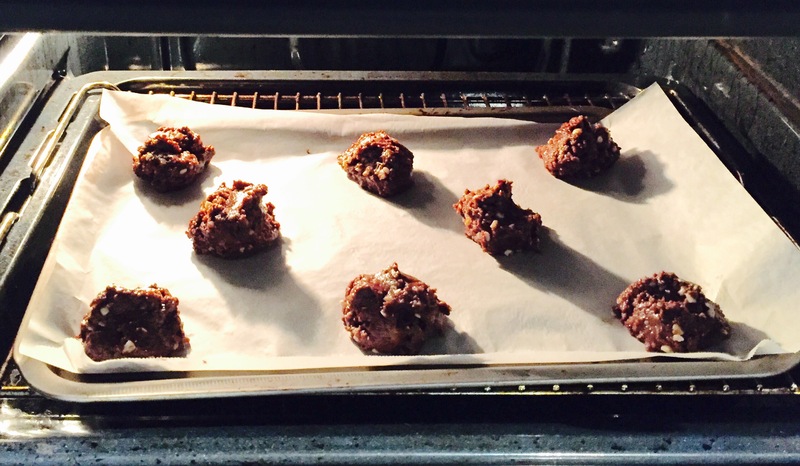 Place balls of dough onto a lined cookie sheet and chill the dough for at least 10 minutes. Otherwise, the cookies may go really flat. Bake the cookies for 10 minutes at 350 F / 180 C.
And there you have it! 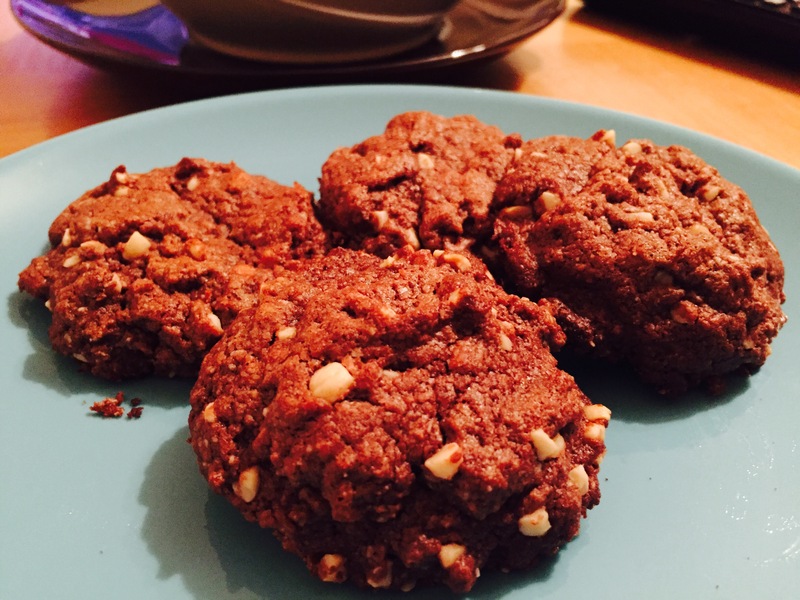 Nutella nut cookies! These were super easy to make. And, ok, so I didn’t use brand name Nutella, but the Aldi brand turned out delicious. You can also try making this with peanut or almond butter, and just add some cocoa. I really love simple recipes like this because you can have fresh baked cookies in about 30 minutes without the fuss. 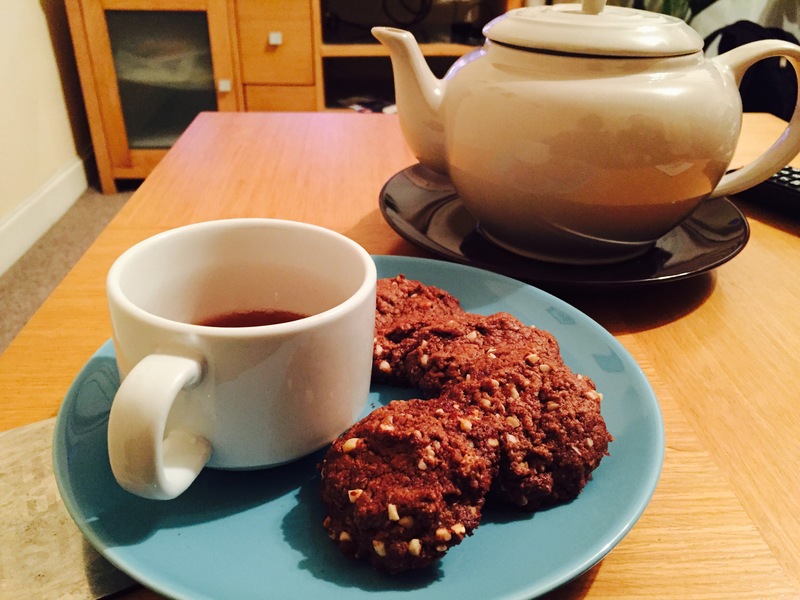 Enjoy your weekend and enjoy these cookies! Thanks for reading and Happy Eating! 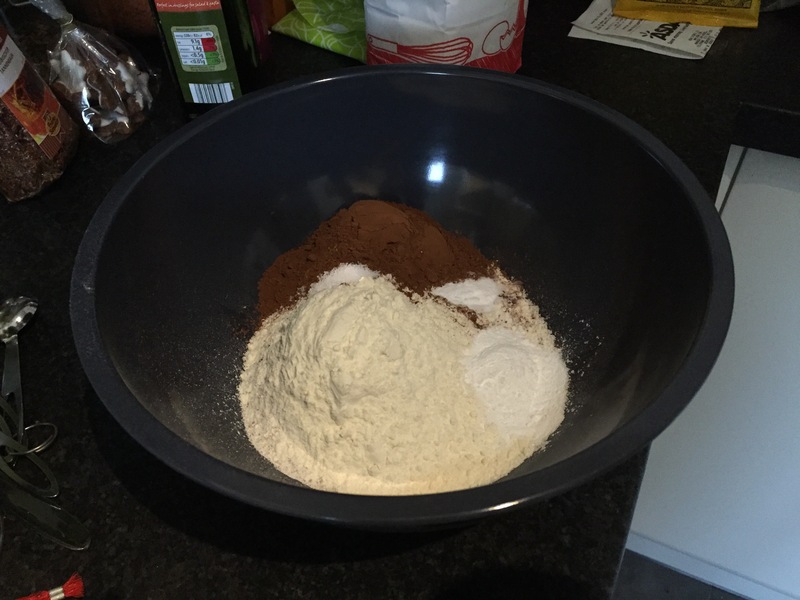 Combine both flours, baking powder, baking soda, salt, and cocoa in a large bowl. 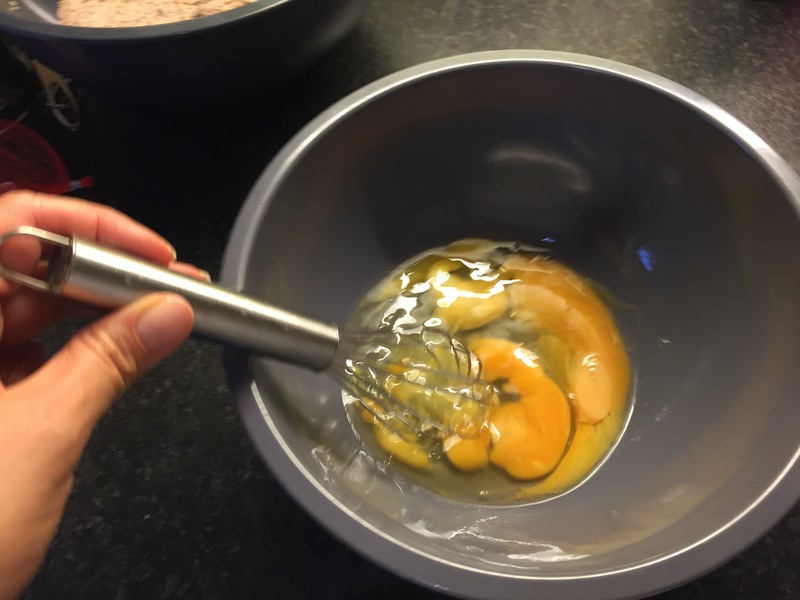 In a smaller bowl, beat all three eggs until nice and smooth. Add the milk and oil, whisking the entire time. Add the wet mixture to the dry bowl, mixing well. Next add the golden syrup. I originally added the syrup to the wet mixture, and it sunk to the bottom. So, you’re better off adding it after you’ve put the liquid mixture into the dry. 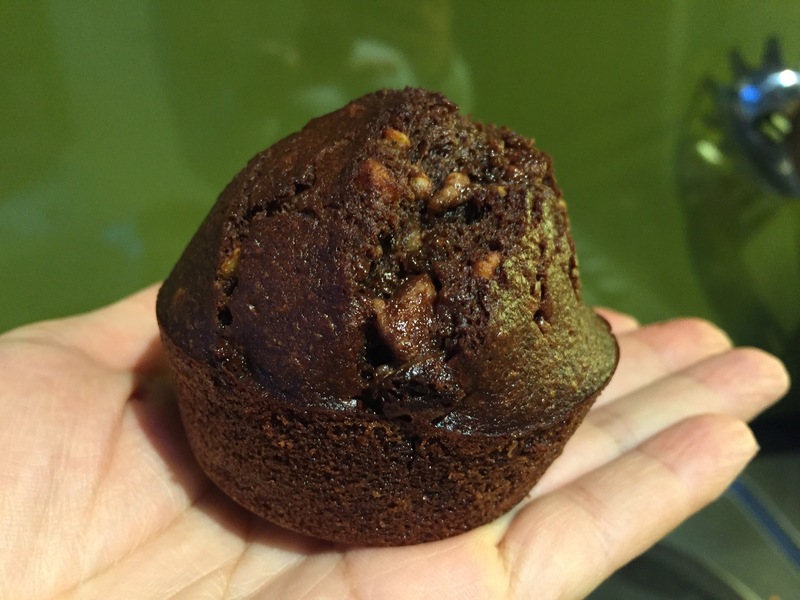 I still had lots of Christmas chocolate left, so making these muffins was a great way to utilize my rye flour and leftover sweets. 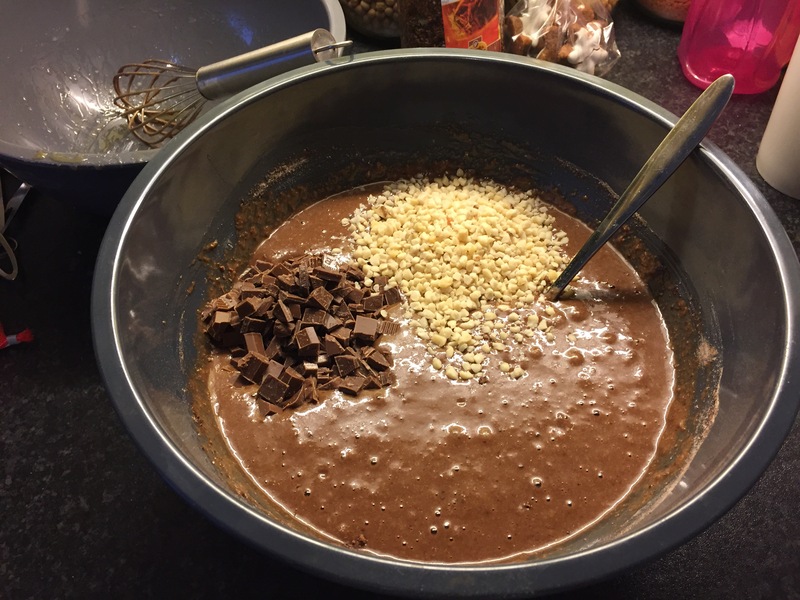 After you’ve mixed the batter, add the chocolate and chopped nuts. 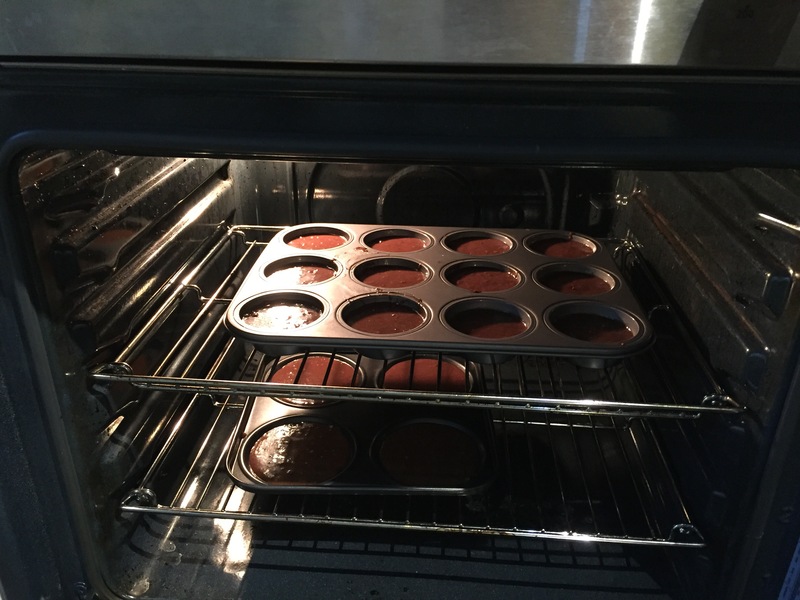 Preheat your oven to 200 C / F. Grease or line a muffin tin and add an even amount of batter to each space. These will rise nicely, so don’t fill up the entire way. 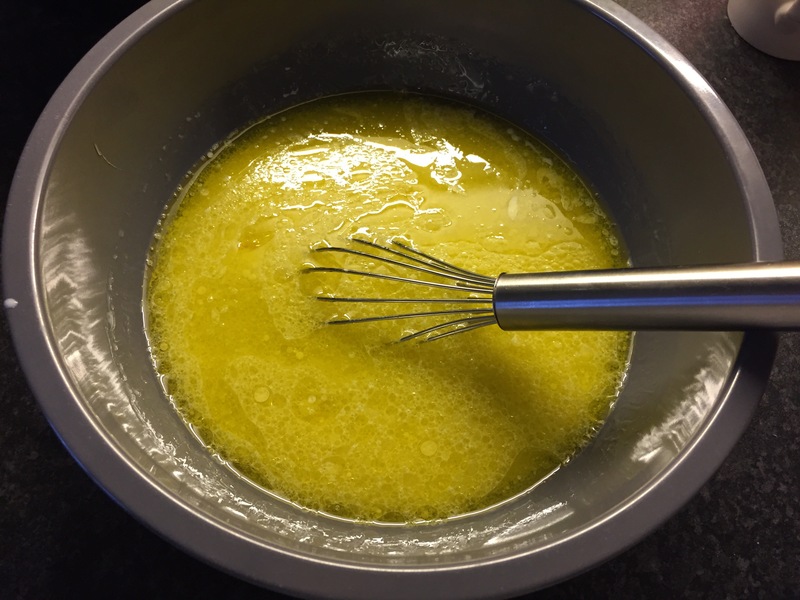 Also, to achieve muffins that are uniform in size, use a large spoon or scoop so that you get the same amount of batter for each. Bake for 15-18 minutes depending on how your oven heats. I took mine out at about 17. And there you have it! 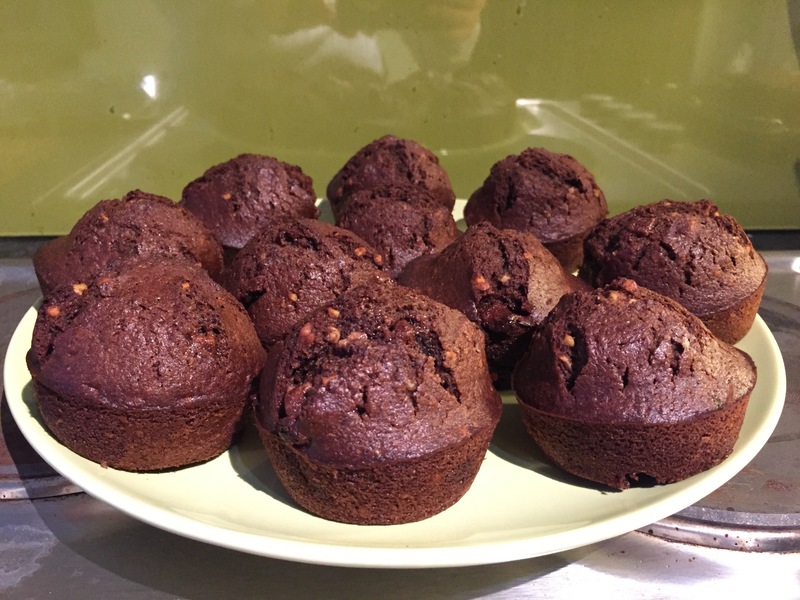 A batch of Nutty Chocolate Rye muffins to brighten up this gloomy weekend. 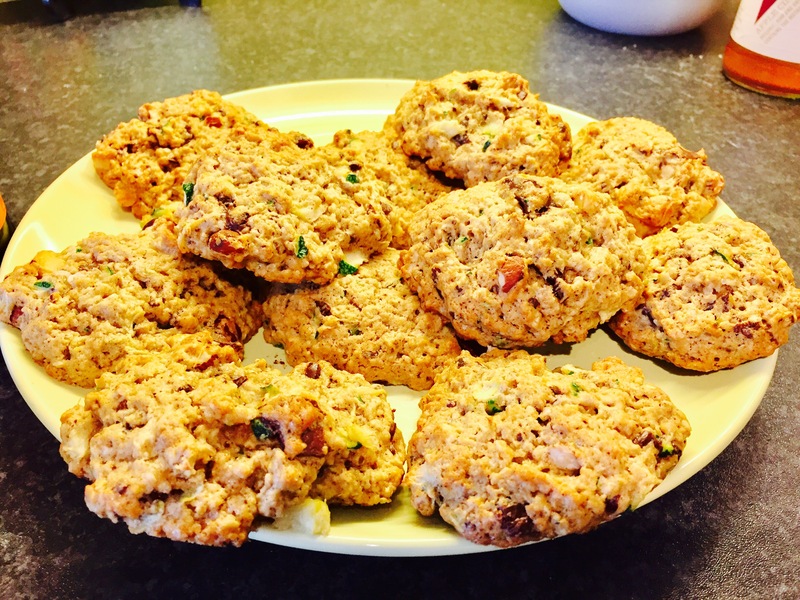 These are perfect to enjoy for breakfast or as a filling snack. 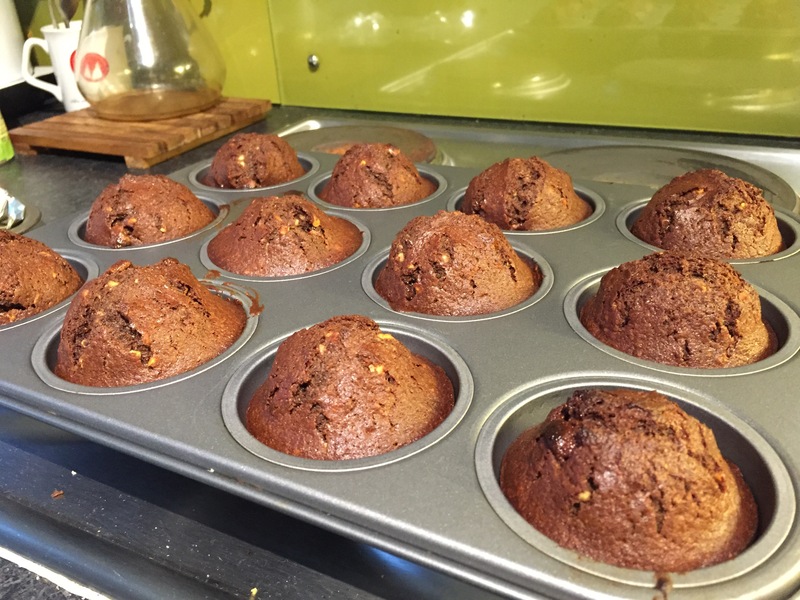 The muffins came out very moist and rich without being overly sweet. If you do require more sweetness, you can add more syrup or chocolate, or even try adding in a bit of sugar. Either way, these will not last very long in your kitchen. Enjoy what’s left of the weekend and if you have the time, try baking yourself something sweet to start off the week! Thanks for reading and Happy Eating!